Editing of the Blount Lumber Company book is complete and printing is under way in time for Christmas. The books will go on sale at the Sandy Creek Town hall through the town clerk’s office or my office (Sandy Creek History Center) after December 17th and the cost will be $20. Books can be mailed by sending a check covering the cost of the book and postage. 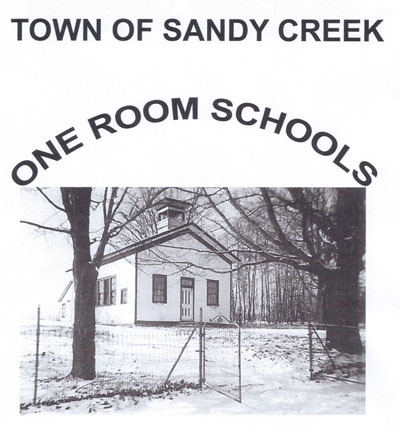 A new book - Every new book project starts small and after beginning research on the new “Doctors of Sandy Creek” book we realize what a big project it actually will be. This community has had the great good fortune to have been served by competent and dedicated doctors, from the time people first settled here in the early 1800’s right down to the present time. 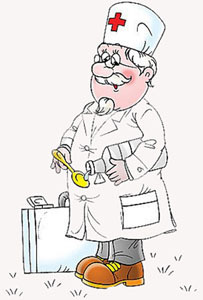 The first physician in this area was a Dr. Porter, about whom not too much is recorded. We must give the honor of being the first local resident doctor to Dr. James A. Thompson, who came in 1815 and practiced medicine here for forty-four years, until his death. The County History (1789-1877) states also that his son, Dr. Allen Thompson, had been a doctor here for 43 years. This town has had several father and son combinations and three-generation group represented in the local medical profession. This will give me an idea on how many books to order. This book and the upcoming “One Room Schools” book can make great giftsfor the history buffs on your Christmas list. This book is dedicated to all the brave soldiers who fought for freedom and democracy whether on the home front or overseas. 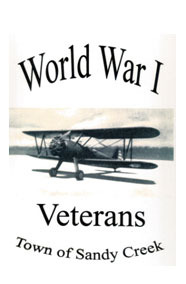 It is my hope that I have found and included all these brave men/women who wanted to be in this book. The criteria included born /died in Sandy Creek, attending Sandy Creek Central School, living or working in this area. 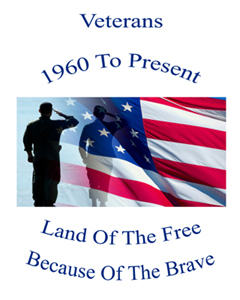 This 200 page book includes pictures of some veterans, a timeline from 1960 to 2010 and the military history of veterans who submitted information or we gleaned from other sources. The cost is $20 ($25 by mail). 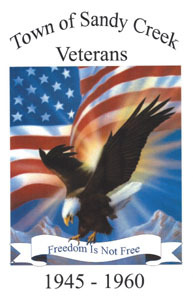 View names of our vets from this time frame here. 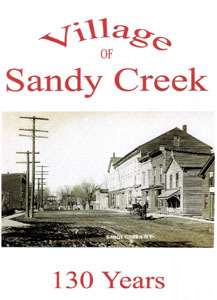 During the Civil War the town of Sandy Creek, which in the census of 1860 reported a population of 2,431 furnished over 220 men for the Union Army. Few were the homes here that were not anxiously awaiting news of a son, a brother, a husband or other relative at the front with his regiment during the years of 1861-1865. On April 9, 1865, the date of Lee’s surrender, the old town bell that’s tolling had all too often brought tidings of the death of a loved one was rung for six hours, the welcome story that it proclaimed bringing joy and thanksgiving to all. “There were two – and they were brothers” Allen Joseph Thompson and James Granville Thompson….a story of two brothers from Sandy Creek who won the Medal of Honor. Antietam : Company G from Sandy Creek: Moreau J. Salisbury was struck by a bullet in the ankle or instep which passed through the heel, making a fearful wound which left him with a limp. His family donated his boots to the History Center to the delight of 4 th graders every year. Merrick Salisbury was struck by a musket ball that lodged in the knee joint under the knee pan was a mortal wound. His father brought his body home to be buried in Stevens Cemetery. 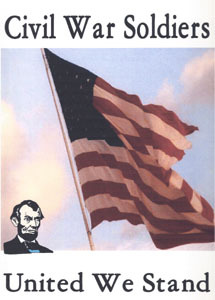 Henry F. Roberts was born a slave but gained liberty before the Civil War and served in Company F, 29 th Connecticut Volunteers. 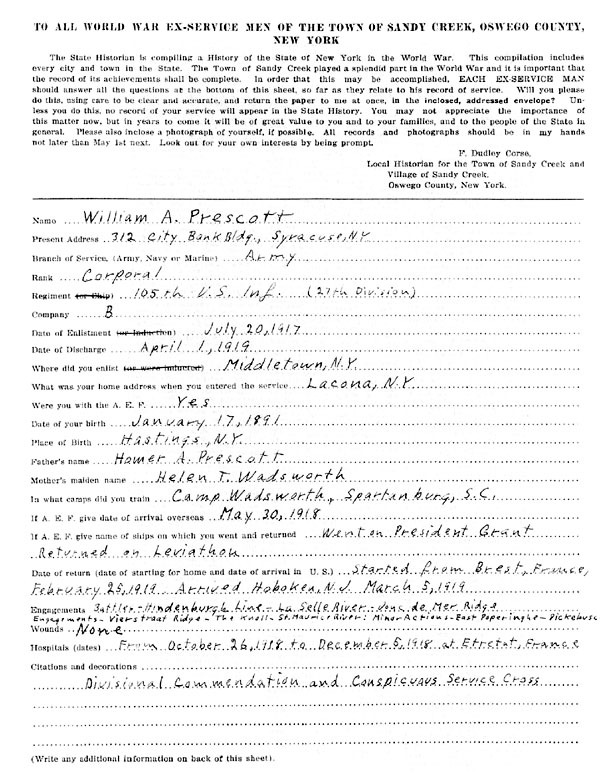 After the war he moved his family to Sandy Creek. 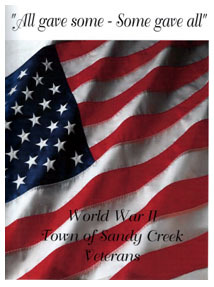 Everything you want to know about Sandy Creek Village History and many photos, including before and after photos! The California Block received its name from the fact that the money with which it was built came from California by the builder who was what is known as one of the old Forty-Niners. Salisbury House served as a temporary home for many of the towns’ early settlers and the first town meetings were held there in 1825. This temperance house was the outgrowth of the inn “part frame, part log” kept by James Hinman as early as 1812, when there were only two or three frame houses in what is now Sandy Creek Village. 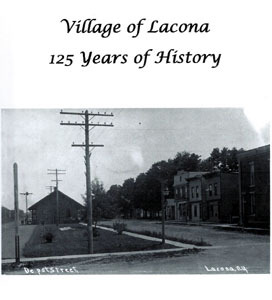 The Lacona Depot was the hub of village activity for more than a century and today is the office for the village offices. 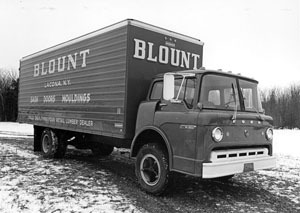 Blount Lumber Company was the largest employer for over 99 years. Included are many before and after photos of businesses and houses as well as family genealogies. 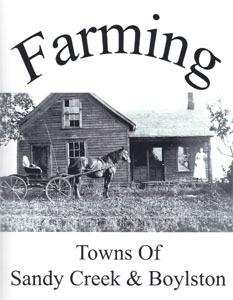 This book is the first of two that, through memories of residents and vacationers, tells a verbal history of the area. 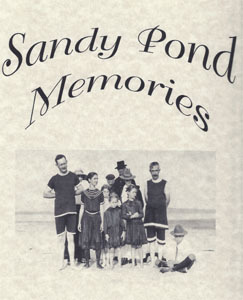 Although many attempts have been made to change the name of Sandy Pond, none has been successful. One of the names suggested was Wigwam Cove, reflecting the legend that an Indian Village once existed on its shores. Later “Ontario Bay” was used to some extent, but “Sandy Pond” is still more common and widely known, with the various shores where development has been carried on each having its own designation. 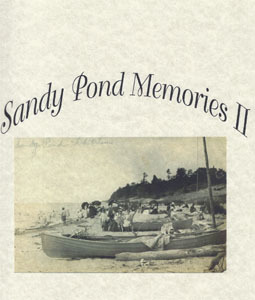 This book continues the history of Sandy Pond and contains photos and history not contained in the first book. 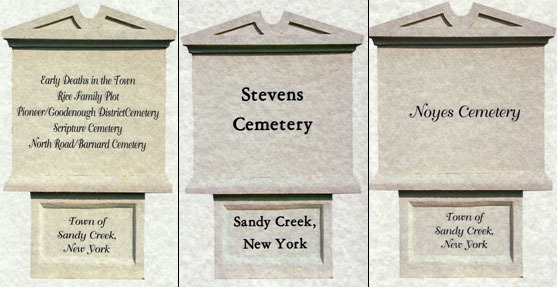 We have two active cemeteries and have to date completed only one. 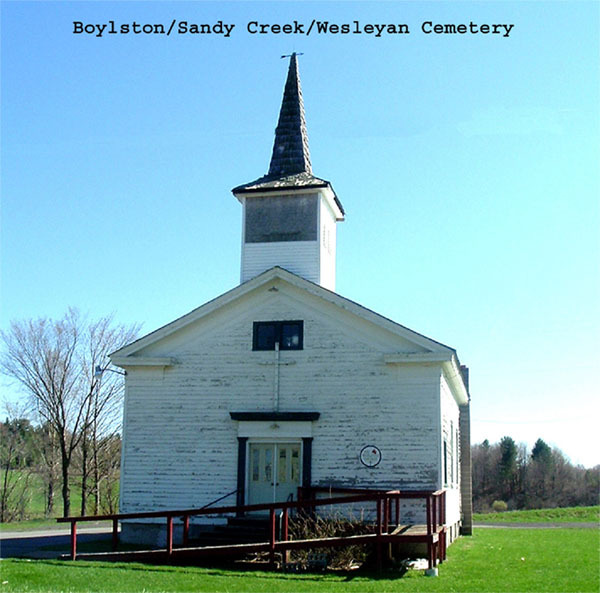 This compilation documents early families, early farms and businesses associated with the farming community within the boundaries of the Town of Sandy Creek and Town of Boylston. Research began with the early migration of settlers using records including census, tax rolls, and local history books.